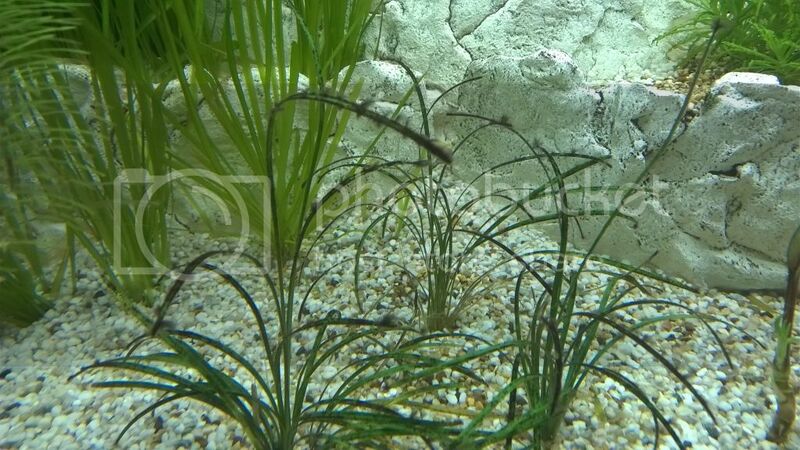 Just come home from a few days away to find some of the plants have Blackbeard Algae on them. Should I rip them out or is there a good treatment? Pinch the leaves off at the base, increase flow if possible. If it's a slow grower move it out of the brightest light. Cheers. I've got a small stick on filter at the far end of the tank to help with the flow. I'll get another one. It's usually too much light and poor nutrients. Now you could be adding plant food but if it's a poor flow area the nutrients might not be getting to the plant. It looks like you have an inert substrate, so you want the nutrients to be flowing everywhere, especially on the base where flow can be poor, because the plants cannot take up much (if any) nutrients with their roots - that's fine they adapt more than adequately with their leaves. But combined with too much light is a magnet for algae, because algae is a lesser complex plant and can thrive in lesser conditions if that makes sense... (gosh the brain has got stale with not being around much lol). There's about 1.4W per gallon in there for 10 hours a day, should I tweak that down a bit? There's no direct sunlight but a fair bit of reflected light from the conservatory. I'm using liquid carbon and iron but not often enough! And I'm not using ferts. As for the flow, there's a flow output from the pump at the top right of the tank projected to the left along the back and there's a small hang on filter on the left pointing forwards. So the water circulates but by the time the water movement gets to where the worse affected plants were it's quite slow. I'll get another pump later today. Good to see you back exercising your brain! I'm not using gas CO2 atm, my lights are on for 7 hours. On at 3pm and off at 10, I would cut them back an hour or so. Didn't manage to get to the lfs today but I've cut the timer back by an hour.